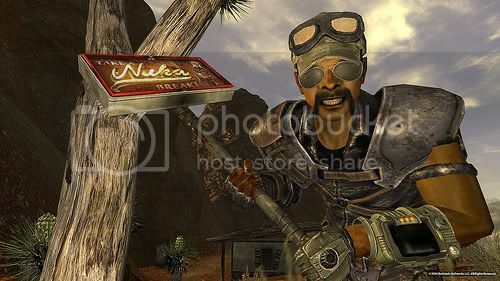 a man by the name of Ulysses who refused to deliver the Platinum Chip at the start of Fallout: New Vegas. Ulysses promises the answer as to why he didn’t take the job, but only if you make one last journey into the hurricane-swept canyons of the Divide, a landscape torn apart by earthquakes and violent storms. It’s up to you whether you take the job or not. Today we’re also announcing two additional DLC packs, Courier’s Stash and Gun Runners’ Arsenal, which will be available for download one week later on September 27th. Courier’s Stash (Xbox LIVE for 160 Microsoft points, PlayStation Network and Steam for $1.99) gives players immediate access to four content bundles previously available only through pre-ordering Fallout: New Vegas. The Caravan Pack, Classic Pack, Mercenary Pack and Tribal Pack each offer unique weapons, apparel and aid advantages that will help you throughout your journey. Gun Runners’ Arsenal (Xbox LIVE for 320 Microsoft points, PlayStation Network and Steam for $3.99) increases the range of unique weapons, weapon mods, ammo types and recipes waiting to be uncovered in the vast Mojave Wasteland.